Students question use of trademarked logo - NCHS Live! Junior class apparel is sold every year, but this year a trademark infringement might cause trouble. 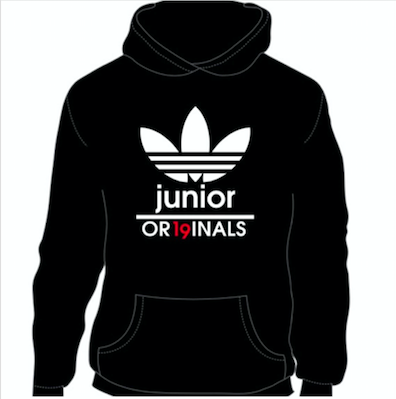 The item up for discussion is a black sweatshirt on sale with a white trefoil logo and the words “JUNIOR OR19INALS” printed underneath. The trefoil logo and slogan from Adidas, on the sweatshirt in question can only be used with permission from the company due to copyright laws. The Junior Class Council is made up of 25 juniors that are voted in by their fellow class members in September. They are supposed to vote on all apparel ideas and then order them for students to buy. “We had no say in the sweatshirt design. They just kind of showed it to us and were like this is what we are going to do,” an anonymous member of class council said. Paige Vinson is the Junior Class Council advisor and oversees all decisions made by the council, including the approval of apparel. She disagrees with the assertion that the sweatshirt violates copyright. “I don’t know that it’s copyrighted, all design ideas go through principal’s cabinet and it got through principal’s cabinet,” Vinson said. The principal’s cabinet is made up of Branigan, the assistant principals, the deans and other administrators. All of these members approved a sweatshirt that uses the Adidas trefoil logo and a modified version of the “Juniors Originals” slogan. Although the slogan was modified it is still the same concept. This is where copyright or trademark comes into question. “You may not modify, copy, distribute, transmit, display, perform, reproduce, publish, license, create derivative works from, transfer or sell the content or any part thereof, except as explicitly permitted,” the Adidas website said. The Student Press Law Center provide free legal assistance and information for cases like this. Lawyer Mike Hiestand answered questions regarding the sweatshirt. “It’s a trademark issue here. Adidas has a trademark on their logo on this particular image and the basics of the trademark claim is that there is some likelihood of confusion on the part of the consumer, would somebody looking at the sweatshirt be confused at all with thinking this is an Adidas product, and I think the answer is yes. You put an Adidas logo right on it and from the image you showed me it’s virtually identical, yes, there is a trademark problem,” Hiestand said. Copyright protects more literary and artistic works, like books, whereas trademark protects logos for companies. The sweatshirt with the trefoil logo on it does violate Adidas’ trademark rules. “What could happen here is they would send you a cease and desist, they would have to quit selling immediately and pull everything off the market. There would be some sort of financial consequences for any sweatshirts they sold, they might owe Adidas some money for that,” Hiestand said. Cease and desist letters ask who ever defied the trademark law to stop selling products with the logo. If the third party does not stop selling it can lead to a lawsuit or other legal action. The sweatshirt has already been sold. “It’s way too close to trademark to play around with this. Adidas might have a claim but the chances of Adidas actually going after a high school in Indiana is kind of bad publicity for them. The financial damage to them is pennies but the bottom line is this is a not a profit that should have been pursued,” Hiestand said. Adidas is not going to pursue a claim with a case this small, but it does not justify why it was approved. “Theft of artistic expression: Plagiarism is also defined as the representation of another person’s creative expression as one’s own. Using all or part of a design, an image, a musical composition or arrangement without giving due credit to the appropriate artist or composer constitutes plagiarism,” the student handbook says. The Adidas logo used by Junior Class Council is a copy of something already created. Despite the blatant use of trademarked material, “I mean we haven’t used their designs,” Vinson said. Is Restraint Needed at the End of Basketball Games?